Our guide in Amman had the rather unlikely name of Basel Ahmed. Had I but known it, his name was the perfect metaphor for Jordan itself: on the crossroads of Christianity and Islam. He had two seemingly irreconcilable passions: history and cuisine. While on site – Jordan has an unfair proportion of world famous Roman ruins, ancient Christian churches and rock-hewn cities – Basel would hold forth on pediments and apses. While we conversed in our free time, he talked effortlessly about jameed, the rock-hard balls of dried yoghurt that lies at the heart of Jordan’s national dish. If his details of the acanthus leaves atop Roman columns were a trifle dry and lacking in liveliness, his seamless detailing of the ingredients that went into the array of starters known as mezze was no short of spell-binding. Ahmed’s father was a chef who spent much of his working life in Kuwait. 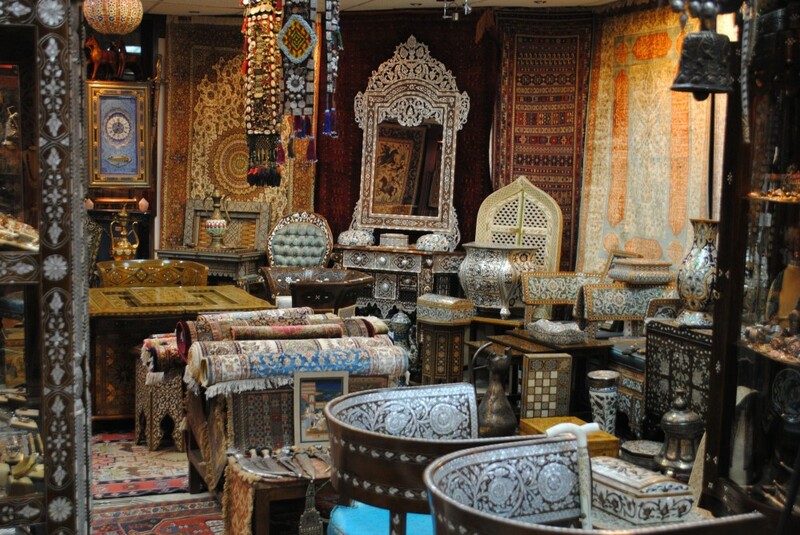 What his son picked up was Jordanian cuisine, albeit seen from the perspective of a neighbouring country. 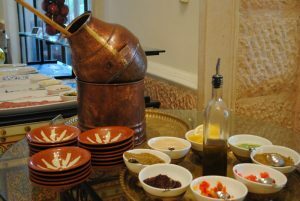 Much of what constitutes Arabian cuisine has similar dishes; it is the details that make the difference. Thus, rice or mince-filled vine leaves are common to Greece and the Levant: Jordan, Syria and Lebanon; each country makes it rather differently. Similarly, the fresh cheese known as shankleesh is available across the Levant and Turkey, and so on. My rather naïve impression was that Arabic food was meat heavy. It was an impression that was to undergo considerable change. Breakfast, for one, was invariably an entirely vegetarian meal. 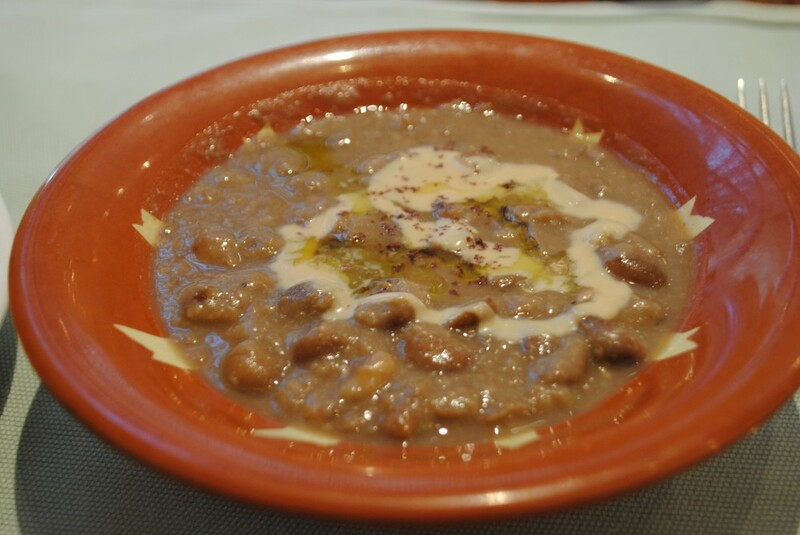 Ful – dried fava beans – were slow-cooked into a stew. The only richness was the texture: thick, almost solid was way better than thin and watery. Each of the hotels we stayed at during our five days in the Kingdom, most run by international chains, offered a ful counter. This always had its own set up within the breakfast buffet, as if to emphasize its almost sacrosanct nature. The baraka, a narrow necked, round bottomed pot made of copper and tinned inside and out, stood on its own stand, inside which lighted coals could be placed, to keep the ful warm. You scooped out as much of the fava beans as you wanted, and helped yourself to a wedge of lemon, cumin powder, more fragrant than anything in our region, za’atar, tahina or sesame seed paste and good quality olive oil. Our guide told us that most people in the region agree that Egyptian ful is rated the highest. “But I consider our ful the best” he ended triumphantly, with suitably patriotic fervour. Lunch and dinner both start with mezze. There are a few rules: breads take the place of cutlery, the plates are placed in the centre of the table and you scoop up what you want with khubbuz bread. In theory, there is an endless array of dishes that collectively are known as mezze, which itself is of two varieties: cold and hot. In practice, hot mezze are often dispensed with entirely, and only cold mezze are served; that too, in their truncated version, which means barely half a dozen. Thus, hummus, muttabal, baba ghanoush, labneh, salad with fattoush, muhammara and tabbouleh made their appearance like clockwork, but waraq inab, kibbeh and falafel kept themselves resolutely hidden from our view! 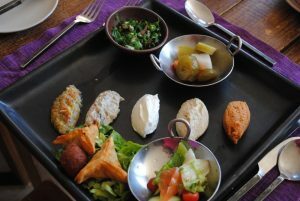 Cold mezze is one hundred percent vegetarian, which is why I am always surprised that the Levant gets so few Indian tourists. Thai cuisine, by comparison, has little to offer the vegetarian, but Thailand gets a hefty share of Indian travelers. Snacks and food shopping too are of the sort that every card-carrying Indian is likely to be attracted to: figs, several kinds of dates, dry fruits, baklava and chewy toffees studded with pistachios and almonds. Then, there are spices – Basel Ahmed took us to the souk in the southern city of Aqaba where we went berserk picking up fragrant cumin, za’tar: a unique blend of herbs and spices in one glorious mix, helped along with traces of olive oil, toasted and salted sesame seeds. If our meals tended to be photocopies of each other, it was because the Jordanians genuinely have not thought enough about showcasing their cuisine. 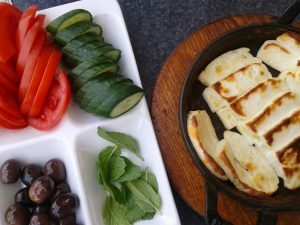 It is largely the same as Lebanese and Syrian food, but within that ambit, each of the three countries does the same dish slightly differently. Thus, Jordanian hummus was composed of equal parts of chick pea mash and tahina – in the other two countries, hummus has far less tahina and discernibly more lemon juice. The three Ms were the glory of the cuisine, however. 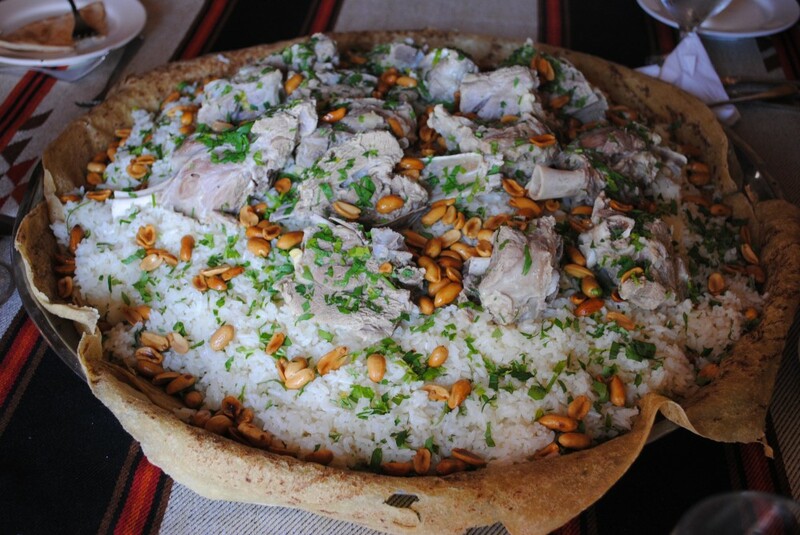 Masakhan, maqloobah and mansaf. What is endearing about these dishes is their flexibility. You can interpret each in the way that appeals to you. And if you find it considerably different from that of your neighbour, why, that’s the beauty of this cuisine. Masakhan (which we never did get to taste) is essentially pieces of chicken sprinkled over with sumac, the tart dried powder of berries, on bread. It is more of a hearty snack or a side dish than a main course. You will get vastly differently results from pita bread or flatbread. 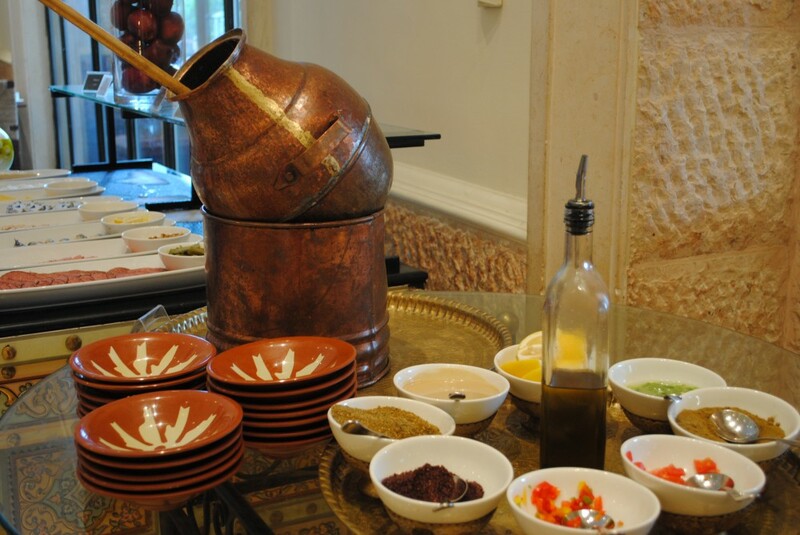 Masakhan is said to have come from Palestine, but has been co-opted into Jordanian cuisine. Maqloobah has even more variations. The Managing Director of Jordan Tourism Board cited it as an example of Jordanian flexibility and he has a point. You can make this “upside down cake” with beef, lamb, chicken or only with vegetables. It contains rice cooked in stock, batons of zucchini and gourd as well as the meat in large slices. It is the way it is layered into a deep cooking pot and then tipped out onto a serving dish, in the manner of a pineapple upside down cake, that gives maqloobah its name! It can be eaten with salad or yoghurt. And if that’s not being flexible, what is! Mansaf was the only Jordanian dish that we did get to taste. Rather like the Kashmiri Yakhni, in which chunks of mutton are cooked in a curd-based gravy, it is a community dish that is made for celebrations or Sunday lunches. I guess I’ll have to head back to that wonderful country for a taste of the other two.